It’s been precisely seven days now since Ocean Watch and her crew stepped ashore at Seattle’s Shilshole Marina to close the circle on the expedition Around the Americas, and in a lot of ways, the last week has been a whole lot stranger and more bizarre than the fifty-five – the length of the voyage – that proceeded it. The core crew of OW – never known or described as paragons of organization – has been a good deal more disoriented and discombobulated than usual, which is saying something. But the truth of the matter is finally becoming crystal clear: There are no more provisions to be laid in, courses to figure out, or watches to stand. We’re home, and it’s good to be here. Um, we’re pretty sure. The hardest part of an extended voyage, as many sailors will attest, is finishing it. You think, feel and act differently. Your internal clock, once set by the wind and the waves and the rhythm of shipboard life, is now governed by the uncontrollable, inconvenient and external realities and pressures of a 9-5 schedule and rush-hour traffic. You look at the world, and particularly its trials, travails and trivialities, in an altered and bemused state. Or at least you try to. The trouble with all this, of course, is that society hasn’t changed, even if you have. And if you can’t deal with it, that’s your problem, and nobody else’s. We’d been back precisely two hours, after much attendant hoopla at Shilshole, when skipper Mark Schrader, dropping me off downtown, was pulled over by a Seattle cop because the registration tags on his Volvo had expired. Granted, being a policeman is not an easy job, but by any standards, the officer was a particularly dour sort. Anyway, I have to say that the irony and timing of the situation, the deathly serious attitude of the totally miserable policeman – after all, this wasn’t a bomb in Times Square – and Mark’s understandable frustration with all of it struck me as fairly hilarious. Mark failed to, uh, share my mirth. Welcome back, Kotter? Nope, welcome back, Captain. Have a nice stinking day. In any event, due to a veritable whirlwind of activity, as we got onto the business of wrapping things up, matters improved measurably within fairly short order. First off was a reception and dinner at Pacific Science Center, a wonderful affair where we caught up with oodles of friends, family and supporters. The next day was a Marine Health Symposium at the Applied Physics Lab of the University of Washington, with presentations from many of the scientists we’d partnered with on projects during the course of the expedition – it was great to reunite with them and learn more about their ongoing research, and our role in it. Finally, there was a big Open House at Fisherman’s Terminal followed by a public presentation at PSC’s Eames Theatre. David T’s photos were sensational on the big IMAX screen. And then, our official duties – presto! – were over. The Aussies have a great saying about the passage of time: From go to whoa. Suddenly, the go was gone. It was all about the woe. I mean, whoa. Since then, we’ve been lugging gear off the boat; emptying the fridge and freezers (chicken, anybody? ); hauling more stuff off Ocean Watch; trying to assimilate into some kind of routine that resembles our former lives; and ferrying tons more gear off the yacht, whose waterline seems to rise considerably with each passing day. When I sat down to write this little missive, I did so with the full intention of trying to sum up the experience of sailing Around the Americas. But…I can’t. Not yet. Like my mates and brothers in this crazy adventure, I’m still numb by all of it. Please bear with me (and us) for a little while longer. I’ll post another update, a reflective one, early next week, with details on new content for our website, which will remain active and vibrant, and other matters, including the latest news on book and documentary projects and related issues. For now, thanks to everyone, but especially those who’ve stopped by the boat or sent emails, letters and messages to us since our return to Seattle. We’re honored, grateful and humbled. And, you know, confused. As it turns out, the voyage was the easy part. Coming back? Well, that’s a good deal more complicated. Long ago and far away, when Mark Schrader was but a wee lad growing up on a Nebraska farm, on one fine summer day he drew a big circle on a map of the family spread and then hopped on his bike to trace his line. The simple act became something of a ritual. As the boy grew into a man, whenever a matter large or small piqued his curiosity, he’d get out a pen and draw a circle around it. It was a way to bring order, reason and structure to issues and concepts that didn’t always have hard, measurable boundaries. A handful of years ago, on a voyage with his mates David Rockefeller, Jr. and David Treadway, the conversation turned to the topic of ocean health and changing climates, and before too long, Mark was again searching for his pencil. What he doodled this time was a large loop on a map of North and South America, and the trip it symbolized was something altogether different than a lap around some low, flat cornfields. Nope, the idea this time was to set sail on what might best be described as an environmental adventure, a long voyage of learning, research, awareness and discovery on a relatively tiny boat. The journey would dramatize and symbolize the notion that the American continents were a single island surrounded by a common ocean; that what happened on the land would ultimately effect the watery world that surrounded it; and that it was in the best interests of all of us to protect and conserve this most precious, life-sustaining resource. The circle on the map would ultimately be known as an expedition called Around the Americas, and it would come to consume the dreams and lives not only of the three chaps who conceived it, but a wide team of sailors, scientists, teachers and students, as well as countless citizens of that great big island from all walks of life. That circle became an odyssey that left Seattle a little over a year ago, at first bound northward through the legendary Northwest Passage, then southward past the epic Southern Ocean landmark known as Cape Horn, and then once again north for Seattle, where it all began. Today, just before noon local time, after 382 incredible days and with 27,524 nautical miles in her wake, the 64-foot cutter, Ocean Watch, sidled up to a dock in the familiar surroundings of Shilshole Marina on Puget Sound, to put the finishing touches on what had started as a sketch in a notepad and ended up taking on a life and mission all of its own. What began as a dream – and not at all a particularly reasonable one – concluded with arcs of water aimed skyward from the hoses of a Seattle Fire Department rescue tug. As the mist from the fire boat once again settled back into the sea, there was only one thing to say. At long last, Mark’s crazy circle is complete. Fittingly, along with Skipper Schrader, mate Dave Logan, photographer David Thoreson, oceanographer Michael Reynolds and me, the busy typist, for the final miles from Port Townsend, the core crew was joined by a boatload of mates who’ve played a major role in the journey and logged significant miles aboard Ocean Watch on different legs of the voyage. In no particular order, and with sincere thanks to all of them, it was fantastic to wrap up matters with Kirsty Moen, Bryan Reeves, Warren Buck, Dan Clark, Horacio Rosell, David Rockefeller, Jr., Gretchen Hund, Tyler Osberg, Roxanne Nanninga, Bryce Seidl, Axel Schweiger, Harry Stern and Zeta Strickland. Yes, we did. It was an honor and a privilege, the adventure of a lifetime. At the moment, visitors are wandering through the boat, things are rather chaotic, and the crew is having a difficult time processing exactly what’s transpired. Personally, I’m having trouble figuring out if this has been the longest year of my life or the shortest, and if today is the happiest one ever or the saddest. In the days ahead, we’ll continue to file stories here on our website with updates on the science and education programs, future plans for the expedition and some reflections on the voyage. So we’ll save our goodbyes for another day. For now, we’re just soaking things in. It’s great to be home. Okay, one revelation as we roll out the door: Surprise, surprise, we went out to try, in some very small way, to help change the world, and we ended up changed ourselves. Thanks for reading. The circle is closed. Ocean Watch is now on Mars! Well, sort of. For the complete coverage, we are going to our friend and colleague at Pacific Science Center, Alice Enevoldsen. Alice works at Pacific Science Center, and writes a blog called AstroInfo in which she answers astronomical questions from Pacific Science Center staff, and highlight interesting goings-on in the world of astronomy. In her most recent post, she explains how Around the Americas now has a presence on Mars. You can read more of her posts here, and her post on Mars is below. What does Around the Americas have to do with Mars? Well, nothing. But Dr. Amy Knudson from the Planetary Science Institute was volunteering with Pacific Science Center during the exhibit Facing Mars, and she works with the Mars Exploration Rovers doing soil analysis among other things. She was asking if we had recommendations for naming little things on Mars. The names had to be nautical, so I told her about Around the Americas and Ocean Watch. A few weeks later she returned, telling us that she’d proposed the name for one of the patches of soil she was analyzing and it had been accepted! She’s just sent me some photos of Ocean Watch on Mars as taken by Opportunity (also known as Mars Exploration Rover B). She is continuing to name other soils and rocks after Around the Americas’ ports of call. 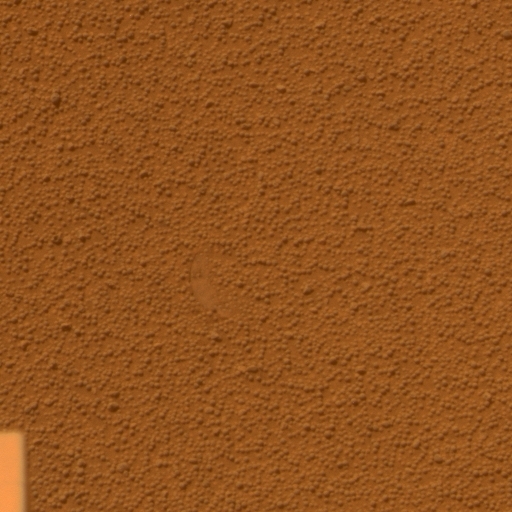 Ocean Watch (a soil on Mars) – field of view approximately 1/2 meter by 1/2 meter. Opportunity took this picture on Sol 2225 (martian day 2225) with its panoramic camera. This image is approximately true color, and shows a small impression where Opportunity’s instrument rested during the soil analysis. Nothing has been released about the analysis of this soil yet – so your best guess about that texture is just great. Be the scientist – what do you think those “bubbles” are? Are they depressions or spheres? Are they hard? Soft? Are they just shapes in the sand that are easily disrupted or are they harder? Look at how they are different when they’ve been pressed by the instrument. Does that help you determine what they’re like? What might have caused them? 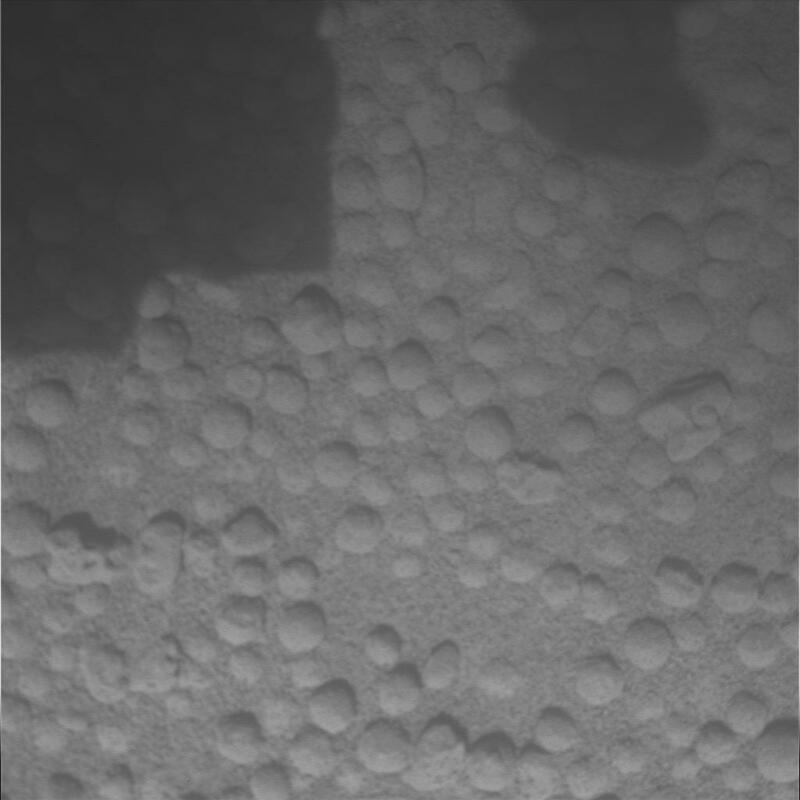 Using the microscopic imager Opportunity took a close up picture of the soil before deploying the “IDD” – the “Instrument Deployment Device” – also known as the arm. 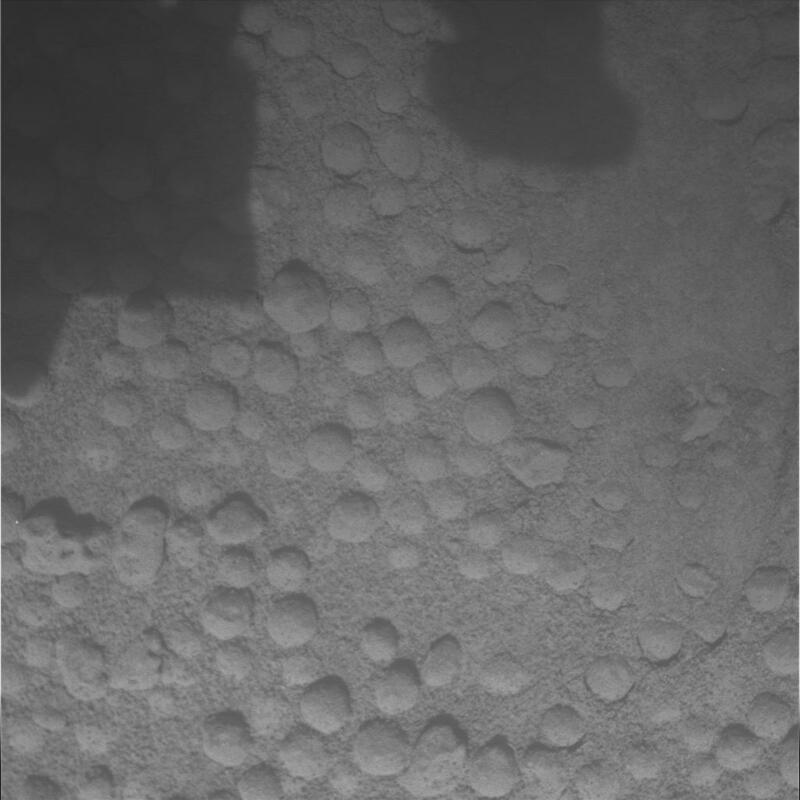 Using the microscopic imager Opportunity took another close up picture of the soil AFTER deploying the arm. You can see where the instrument rested in the upper right of the picture. Some of the little bubbles or depressions are flattened, and others have been entirely squished. If you follow the rover missions you’ll have heard of rocks and landforms on Mars named things like “Chocolate Hills,” “Concepcíon,” “Columbia Hills,” “Endurance,” or “Jenny.” Naming of objects in the solar system has to go through the International Astronomical Union (IAU), which can take years. In order to stay sane and not constantly have to say to each other “let’s take a look at that rock” or “shall we drive to crater 001-5BX?” the technicians and scientists working with the Mars rovers assign their own names to these items. Ocean Watch is such a name. I find it likely that many of these names will stick – having been used for years by the time the IAU has time to choose official names – but some will be changed, and some are of locations too small for anyone to care about once the rover has driven on. Ocean Watch is a very small patch of soil (about 1/4 of a square meter), so who knows what will happen. For now though, a little patch of a distant planet holds a name that reminds us of the fragility of our own planet, and honors the excitement of doing science and science outreach. More information about this soil will eventually be posted in the MER Analyst’s Notebook. * Technically, I wouldn’t use the word “dirt” because that tends to imply organic content … but, forgive me this time. And thank you, Alice, for helping bring a little of the Around the Americas mission to interplanetary levels! If you stroll up off the docks, hang a right and walk down the quiet highway in the fishing port of Neah Bay, after about a mile you’ll come to a tidy little park with flags flying that commemorates three things: the heritage of the First American natives of the Pacific Northwest, the Makah Nation people, the watermen and women who thrived along this rich coastline for centuries; the Spanish explorers that were the first Europeans to also populate these shores; and the local people who’ve served this country with honor in distant wars. Thank you to the soldiers and sailors of Neah Bay. Heaven knows our fortunate and even blessed voyage Around the Americas has been anything but a battle, and this anecdote is not meant to be a comparison in any way. But as I took a walk this morning while waiting for the tide to come in so we could get underway on the final leg of this trip to Seattle, the words rang true for other reasons. For here aboard Ocean Watch, we’re headed home.